LeBron James, Cleveland Cavilers forward, and arguably the new Mike, is on the cover of April Vogue—only the third man to make the cover (Richard Gere and George Clooney are the others). Great—right? Well, check the photo. Not your typical, glamorous pose, is it? Can’t anything be simple? Some folks are offended. They feel King James looks a little too much like King Kong with Giselle Bundchen as Fay Wray. The photo is by Annie Lebowitz, who is known for placing her subjects in surreal settings—think Whoopi Goldberg submerged in a tub full of milk. Is Lebowitz provoking the viewer in her usual way? It’s the magazine’s shape issue and other athletes paired with models include Olympic swimmer Michael Phelps, speed skater Apolo Anton Ohno, and snowboarder Shaun White. But none of the other photos is as. . .intense. So, is this a hot photo of a strong Black athlete doin’ his thing on the cover of Vogue? Or is this the Black man as noble savage—in case we were getting a little too used to looking at the guy in the slim suit and tie who is running for president. I like this photo because it's a great contrast. To me, it just seems that after all these years, and all the trials and tribulations we have put one another through, it's time to stop putting SO much emphasis on race in every situation, big and small. I tend to look at a person for who they are. I can look beyond the skin color. I don't know who's offended by this photo, but maybe they are looking at it through the eyes of their own prejudices. Why does everything have to be "black and white"? When everyone can stop "seeing" into things that aren't there, than maybe racism will come to an end, but if we keep making mountains out of molehills, the hatred is only kept alive. 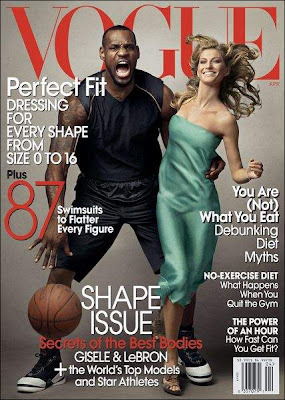 I think this picture is a great way of capturing who these two people are: a super model and a super basketball player. I don't think it's "savage-like". It's strong and powerful. And as someone who can appreciate photography, this was a spectacular capture of the moment. And why can't we see black men as who they are regardless of what they are wearing? Like race, we're judging someone by their cover (what they are wearing). One is running for President and needs to present himself in a professional manner, while the other is an amazing athlete. Both men are strong, but in different ways.